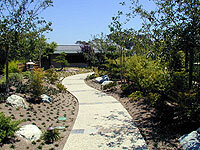 JGarden Description: The Japanese Friendship Garden Society of San Diego has its roots in the 1915 World Exposition. After the Exposition, strong community interest kept the Japanese Tea Pavilion open for thirty years within Balboa Park, San Diego's Culture Center. The formation of San Diego's Sister City relationship with Yokohama in 1950, one of the oldest such relationships in the U.S., this garden was constructed as a physical representation of the bonds that had been formed. The garden hosts a hands-on garden workshop each spring, allowing students to construct various components of Japanese gardens under the tutelage of some of the world's most esteemed Japanese master gardeners and master designers, including the master gardener of the Golden Pavilion in Kyoto, and Dr. Uesugi, 14th generation master garden designer. The garden hosts various other events throughout the year. Amero, Richard W. "Japanese Garden. . . Or Commercial Hodgepodge?" San Diego Union-Tribune. December 22, 1994, p B-11. Fong & LaRoca Associates. Japanese Garden Master Plan, Balboa Park, San Diego, California. Pamphlet, 1979. "A new jewel in Balboa Park." San Diego Tribune. December 14, 1990. Petitti, Nancy Murcko. "The Japanese Friendship Garden In Balboa Park: The Evolution of an Idea." Master's thesis, San Diego State University, 1994.